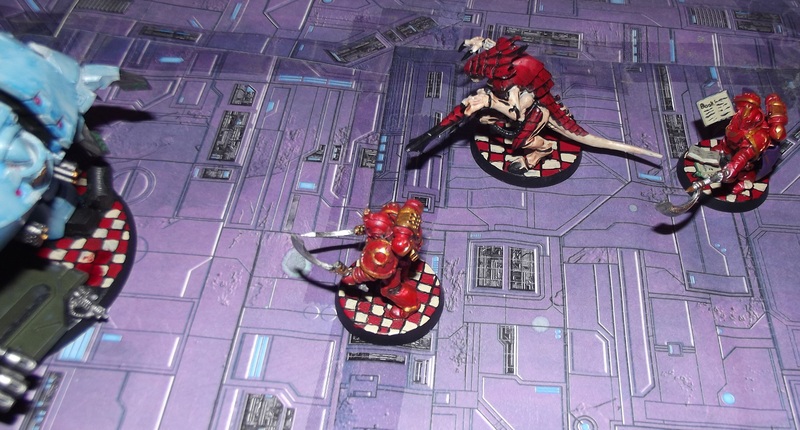 While playing Dark Heresy with my group of friends as the game master I had a few questions about what things looked like from a couple of those who did not play 40k that much. As such an idea formed, one where I could first create models to show them what their characters were seeing and then later after a few suggestions it turned into creating a couple of small dioramas depicting some potential scenes. This was where I started when it came to create a setting for me to run my Dark heresy campaigns. The main location for the current one is called the Nacra system. This planetary system has eleven worlds for the players to explore and sits within the Makuire sector. With the basics in place I set about fleshing out this location, creating enemies, NPCS, allies and native creatures as well as writing up the background for the forces at play within the sector. Created as part of the 15th founding the Void Jackals were dispatched to the Makuire sector to strike down the enemies of mankind where they could be found. Originally a fleet-based chapter that patrolled the sector in chapter strength before attrition took its toll and the chapter responded to a distress call from the Varistan system. 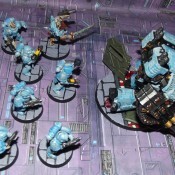 After fighting off the xenos menace the chapter had dipped to below two hundred marines and took to the planet below. They found a pre-imperium structure which they first investigated and then made into their fortress monastery. The daemons mountain as the place was known to the locals and below its towering edifice the Void Jackals made a discovery that would change the course of their chapter forever. 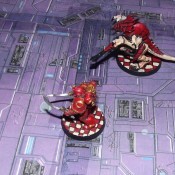 The Daemons mountain was a fully functional knight manufactorium and storage facility. Under the guidance of the adeptus mechanicum the Void Jackals reactivated the manufactorium and became a space marine chapter that also served as a knight house. The higher-ranking marines of the chapter are trained in the use of these knight armours while the most promising recruits are trained to pilot knight armigers. How they tie into the dark heresy game. Three void jackals can be found recruiting from the world of Nacra IV which has a feudal world population. I started with pieces from the Space wolves pack box set. 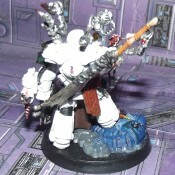 Apothecary Xanthis had a narthecuim created for him and was given a power sword from the dark angels primaris upgrade sprue. 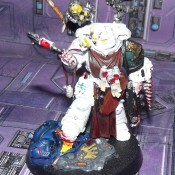 His apothecary backpack attachment comes from the dark angels terminator command squads apothecary and the head from the devastator kit. 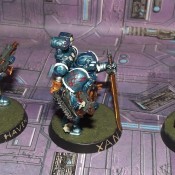 As for his knight mount Xanthis rides in a Cerastus knight armed with an Ion gauntlet shield and a Tempest warblade. Brother Haven favours shooting over melee and has been given a MK III iron armour helm as well as a phobos pattern bolter and a chainsword from the MKIII kit. He rides in a Questoris knight frame which has been equipped with a thermal cannon and a shock lance. 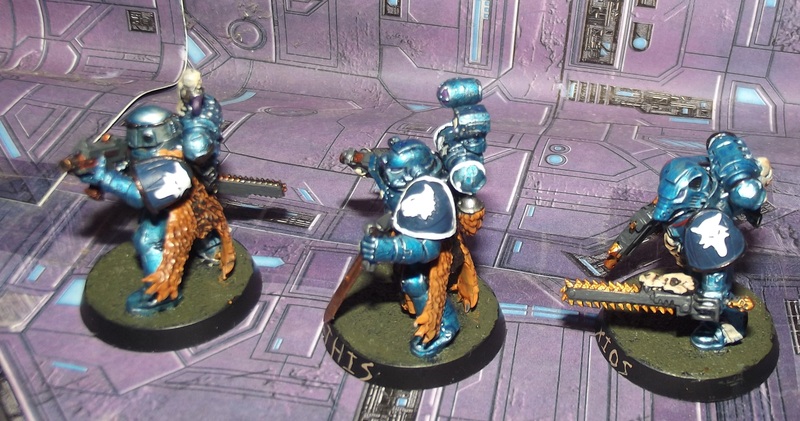 Brother Nixios favours melee more than shooting so while he has the same phobos pattern bolter as his fellow marine he is wielding his chainsword and has been given one of the spacewolf wolf helms. 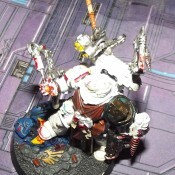 He rides in a Questoris knight frame armed with a hekaton siege claw and an Acheron flame cannon. For the colour scheme of the Void jackals I started with a black undercoat followed by a liberal dose of P3 radiant platinum. From here I painted the shoulder pad and armour rims on both Nixios and Haven Warplock bronze. 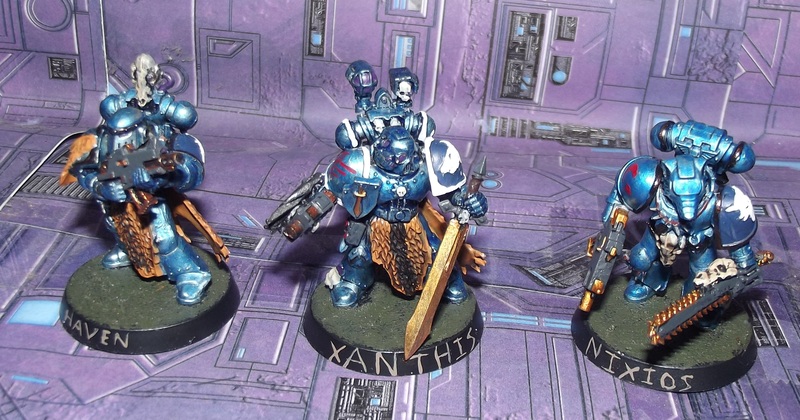 The models were then washed multiple times with blue ink to give them a lovely metallic blue finish. The weapon casing was painted with skavenblight dinge while retributor armour finished off the metallics. Exhausts and vents were then given a pass with black paint. The skulls got a coat of bone before a wash of agrax. The jackal pelts were painted tau light ochre and then drybrushed with black in the centre before being washed. Finally, the jackal shoulder pad was painted with kantor blue and then the jackal head picked out in white. (Xanthis’s trim was picked out in white at this stage.) 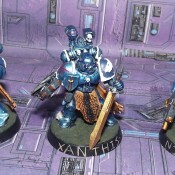 Then the heraldry was painted onto both Xanthis and Nixios. The tale of the renegades known as the fade is a sad one. Originally, they were dispatched to the Makuire sector to replace a lost chapter. Created as part of the 21st founding they were an experiment to see just how far a normal marine could be pushed to be a superior version of the norm. Created with Chimeric geneseed the initial actions of the chapter showed that their warriors had small advantages in every field when compared to their fellow marines. 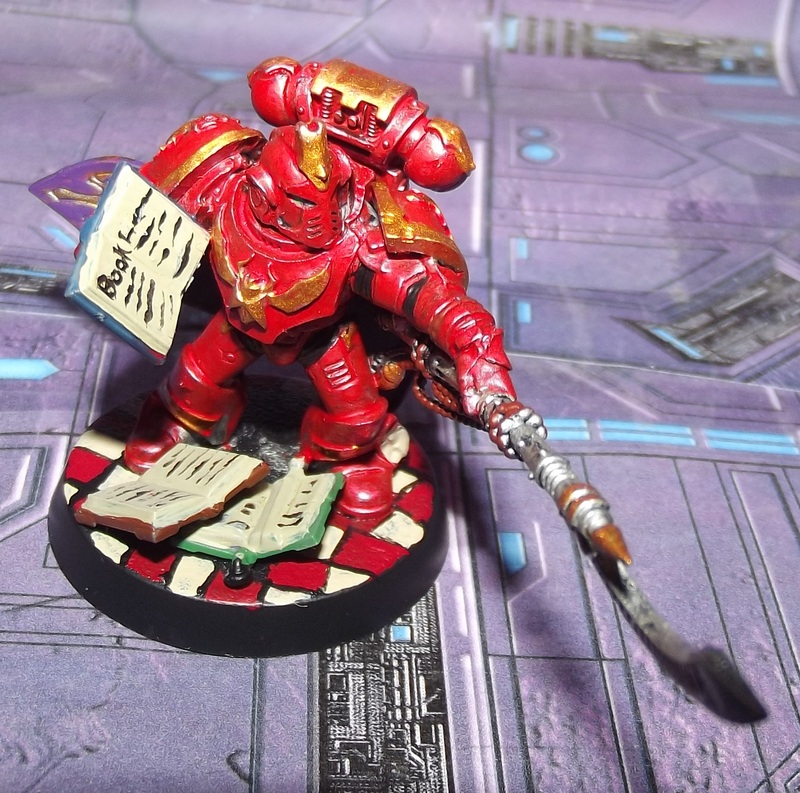 These increased abilities had a crippling flaw which was revealed when the chapters first chapter master died before entering his second century of service. The price paid for the improvements was a vastly reduced lifespan. Multiple chapter masters and magos biologus teams worked to try to undo this flaw by modifying the geneseed to try to boost lifespan. Slight improvements continued to happen until the chapter reached its forty-second chapter master. Vervan Procellae noticed that the chapters librarians were by far the longest lived and through his swift changes to the chapters genetic makeup he managed to vastly increase the lifespan of his brothers. It was then that the whispers started. 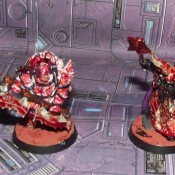 At first they were easy to ignore as the chapter master erected emitters that slowed the aging process but then as the emitters started to degrade the chapters geneseed the affliction known as the fade started to manifest. When a brother of the chapter was affected by the fade they would slowly become less corporeal and would eventually cease to exist. 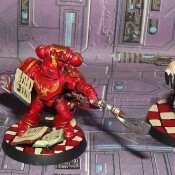 The Chapter master keen to face this new threat head on gathered his librarian and enacted a ritual which catapulted the fortress monastery into the warp. In the warp where they entered, the usual madness had been reduced to nothing and the fortress sat in a pool of darkness. 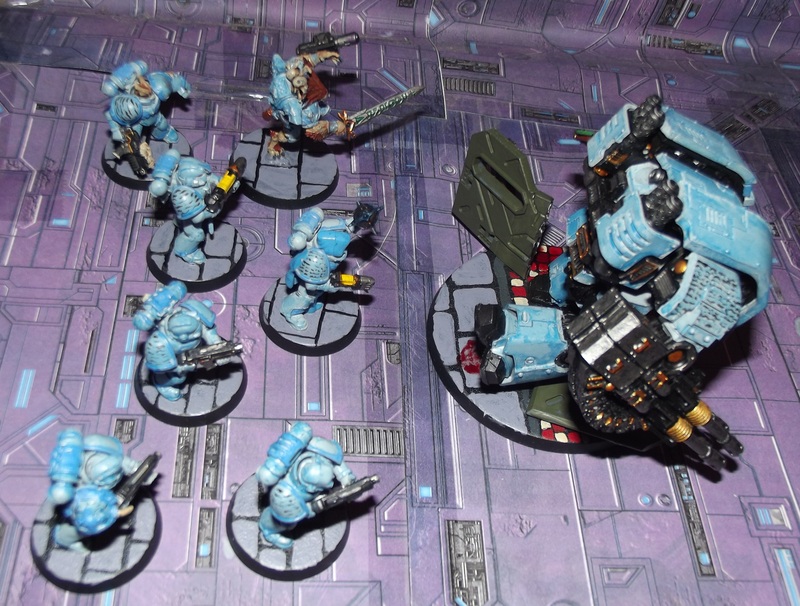 As the marines started outside a massive daemon took the fortress monastery in his taloned hand. The Gellar field on the fortress failed moments later. Normally the failure of a Gellar field while in the warp would be fatal but the Fade were spared. 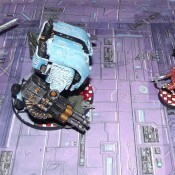 Vervan Procellae confronted a manifestation of the massive daemon who strolled into the hangar. The daemon was Morrs penna and alongside him as he marched, marched those marines who had been claimed by the fade. Procellae was ascended to daemonhood and taught how to use the gift the Fade had been given. Morrs left the chapter in the warp along with a way for them to breach into the materium once more. Each librarian was taught an ability, so they could create gateways to and from their fortress. Attacks by the fade can be subtle or sudden. When striking suddenly an entire company (about a hundred marines, weapons, wargear and vehicles) materialises on the target world and launches an assault. The marines of the fade will either tear through the defenders growing ever more powerful until they reach their objective, or they will be beaten back fading back into the warp. If the objective is necessary, the marines will rematerialize and attack again and again until the objective has been achieved. For the subtle route the Fade will infiltrate the target system and start working on manipulating the planetary population moulding them into a force they can then use to acquire a world or star system, plunder what they need and move on with a horde of mortal followers to make use of. Those who possess a strong sense of self, will retain their human forms and will slowly become stronger as the warp infuses into them. If a mortal lives long enough they become one of the ascended. These mortals also suffer from the blessing and curse of the fade effect and can never truly die. The remainder of those foolish enough to follow the fade into their lair will be transmutated into Tzanngors and then dumped into the 52nd hangar with the rest of their kind. The Fade care little about these mortals and use them as they see fit. As one of the primary antagonists and the force behind the cult of the new dawn I wanted to create a sample platter of models for the fade to make use of. Based on a space wolves Wulfen model. Lupus was created by adding an inferno pistol (from the centurion kit) and a sword (from a stormcast kit) to create this chaos lord of the fade. 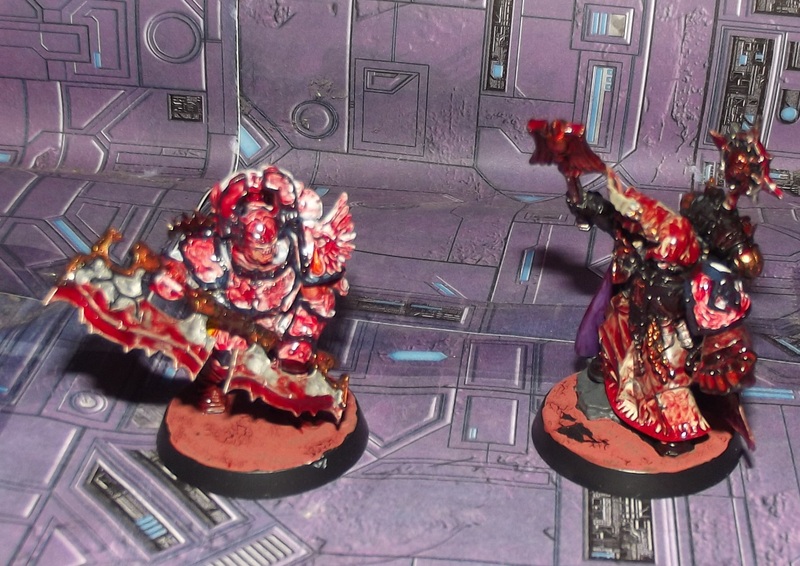 Within the command structure of the Fade Lupus is second only to chapter master Procellae with only Apothecary Nastro [Daemon prince known as the broodmother] and Techmarine Regnus [A leviathan dreadnought modified with techmarine tools and servo arms.] being his equals in the chapter hierarchy. When it came to painting Lupus I used P3 thrall flesh and doombull brown for the skin and hair, before a liberal flesh wash was applied. 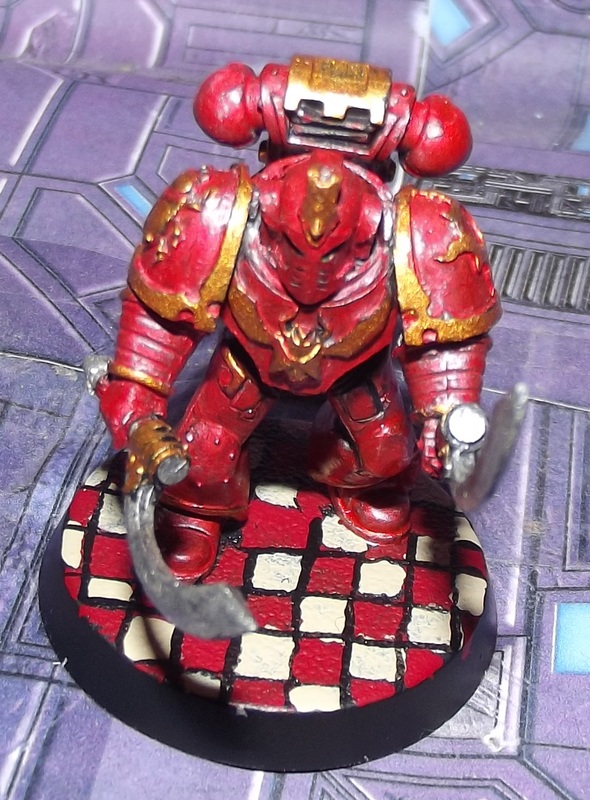 The armour was painted celestria grey and the trim painted calgar blue. The armour plates were then washed with blue ink. His sword was painted with silver and gold before the runes were picked out GW waystone green. His eyes and teeth were picked out in white and he was given red pupils. 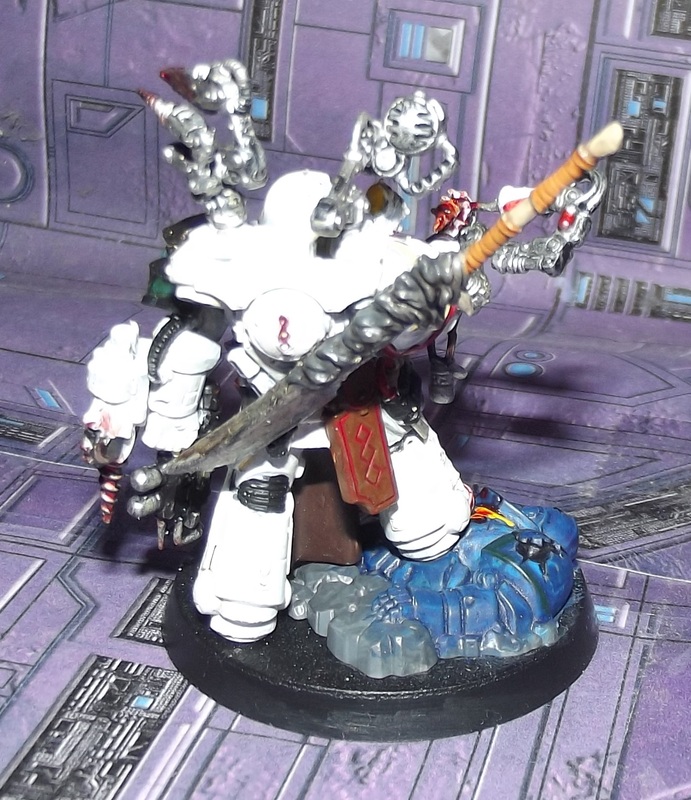 The Sorcerer is a simple marine with a force mace added. The force mace comes from the plague marine kit. A hooded dark angel head was added before a couple of robes were greenstuffed on. His right shoulder pad has small script flowing across it while the left had his symbol fading away. The armour was painted up using the same method as the armour for Lupus with red being added for the eye lenses and teclis blue for his robes. 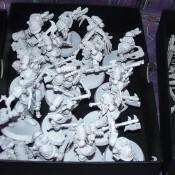 The squad of marines are more of the guys made from the space wolf pack box only with most of the wolf bits removed. 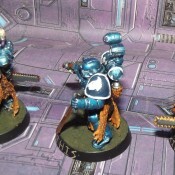 The sergeant has the head from a chaos raptor which was painted like the flesh areas on Lupus. 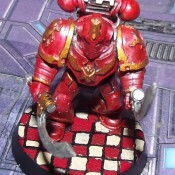 Inquisitor Harkan of the Ordo Xenos is the de facto sponsor of the acolyte team being RP’d by my players, while eccentric his methods get results and combined with his good relationship with the inquisitor lord of the sector allows him to get away with a fair deal of questionable activities. The agents of Harkan are those friendly NPC’s that the players can encounter. Mayhem is a former Khenetai Occult blade cabal member of the thousand sons legion. He exists within his armour as a pile of dust and can act on psychic instructions to make use of his dual swords. He is unable to speak as he lacks a physical body. 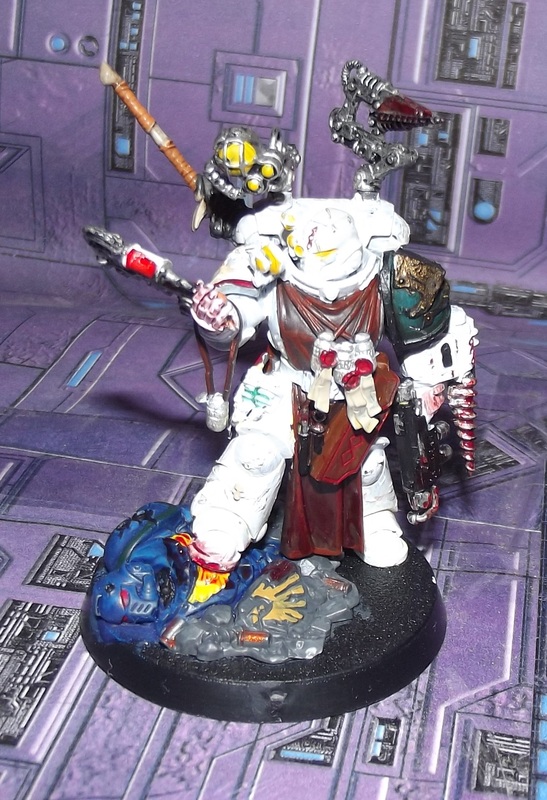 Magelin is former exalted sorcerer of the thousand sons legion but due to a freak psychic accident his mind is now in possession of the body of a tyranid warrior. He has a deathspitter and a pair of rending claws. He also carries a modified lash whip and bonesword he can wield with his rending claws as well as being able to lift and fire a modified lascannon and use machines using the same method. 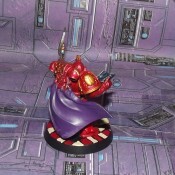 Simons an exalted sorcerer of the thousand sons with the mind of tyranid warrior in charge. Cut off from the hivemind the warrior is little more than a psychic toddler armed with psychic powers and a force stave. Mayhem and Simons were created by using the thousand sons upgrade kit from forgeworld (along with the backpack and force stave from ahirman from the prospero box set [attached to dark angels power maul arm], Simons also uses a hellblaster arm and a pile of books taken from the bitz box..) these were then undercoated with black, painted silver and then washed with red ink to try to get a metallic red finish. Gold trim was then added and the details picked out. Magelin is a tyranid warrior painted in hive fleet Kraken colours. I need to find a suitable red fabric to create some red robes for his model. As nobody messes with the mechanicum. The guerrilla warfare experts of the Makuire sector. The creation of this chapter has had its records sealed by inquisitorial decree shortly after its founding. The chapter uses seagreen armour that features the all-seeing eye of the emperor on one shoulder pad picked out in an off gold. The highest-ranking officers of the chapter are their chief apothecary Narco Synthesis and Chapter Gavlian Thule. 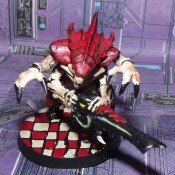 Narco Synthesis has proven to be a genius when it comes to the genetic makeup of space marines providing details on both the results of his implantations and his dissections of captured enemy geneseed. 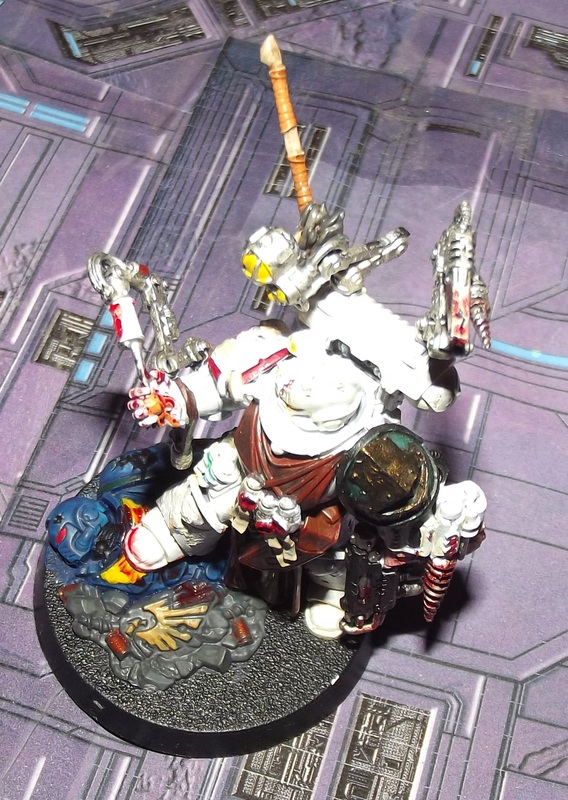 Narco Synthesis is a tad bit sinister, based on the primaris apothecary he is studying the progenoid gland he holds in his hand, which has seemingly been taken from an ultramarine(to show that he goes everywhere and that a force from the indomitus crusade faltered somewhere in the Makuire sector.) Blood was added to where you would expect it to form and a sword (a spare from Kingdom death monster) was added to give him a proper melee weapon. I added a shoulder pad for the all seeing eye of the emperor and while I have yellowed the armour to show its age this does not come through on the pictures. The diorama is planned to be split into separate scenes. The first scene is that of the Fade laying siege to an inquisitorial safe house on a hive world while being supported by their cultists. The Charging pose of the Leviathan dreadnought will form the central area of interest for this section of the diorama. A wall will be constructed to show that he is smashing through a reinforced doorway. Within the room of the building in question I plan to add bookcases and mounted weapons to show that it was once a library. The building wall will also have suffered damage during the fighting. These models are to be part of other pieces of the diorama but as I have yet to make much progress on the respective groups they belong to they are here as sneak peaks. Lovely to read the background to it all. Funny that Thousand Eyes is a name I use around the net a lot. Thanks, I find that a fleshed out background for the factions present in any setting helps a lot when the players encounter them. The Thousand Eyes are a little bit of fun as a character who knows Forbidden lore (Heresy) may be able to recognise their iconography as being something more…. Looking great. Representing characters like that always adds a layer of fun. Looking forward to seeing the result. 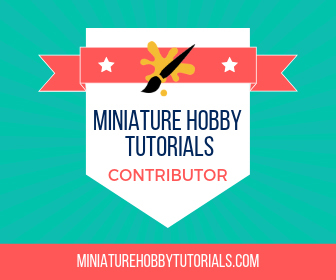 Yeah it is quite interesting to go hunting through multiple catalogues and websites looking for something that can be used to represent the characters (There are two inquisitorial retinues and their inquisitors in the pipeline for this project. Each uses some strange models) and when that isn’t enough hunting for the required bits. I still need to grab a 2by2 tile to use as a basis for the diorama and then plot out onto that where everything will sit. Should be fun.